"In the Talmud it says that a father is supposed to teach his son to swim. Eric knew how to kick, move his arms, and advance in water but not how to swim, and this bothered me, not only because of how well both my daughters swim... but because having a non-swimming son can make you feel like a personal failure. Swimming is living. Swimming is you in the world, making it. To have a son so against disrobing and plunging into a pool that he avoids pools - and lakes and oceans - what kind of future did such a son have?" 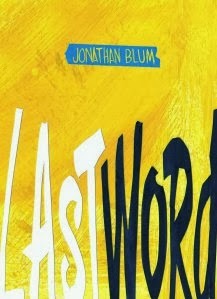 Jonathan Blum's Last Word (Rescue Press, 2013) is a darkly funny yet touching portrayal of the challenges of parenting while human. In this slender novella, Dr. Kip Langer is a loyal if critical father - realistic, he'd probably call himself - striving to do his best for his children and family. Langer is frustrated that he hasn't, so far, raised a more typically successful son, and is at a loss as to how to motivate Eric. When Eric begins to get into progressively escalating cyber trouble at his Jewish day school, Langer wrestles with the best way to do right by him. To read Last Word is to be immersed in Dr. Langer's often humorous, frequently moving, and occasionally appalling thoughts, and often to be startled by their contrast to what is spoken aloud. "I kissed the side of his head. He smelled like a slightly fragrant oil that no one had detected before....I put my palm over my boy's kippah and felt the God-given life force I'd felt in him the day he was born... "
" 'Tuck in your oxford,' I whispered to Eric." These gaps in communication, the failures of emotional expression, happen over and over again throughout the story. Eric becomes more withdrawn and his actions more provocative; the father becomes more fraught, his own behavior more unstable. In the mix are Andi, Langer's sensible and compassionate wife and voice of reason; Eric's typically annoying younger step-sisters; a host of stern school faculty; slighted teacher and object of Langer's secret desire, Shoshanah Kalstein; and Eric's frenemies-slash-peers. Humor is pervasive, sometimes laugh-out-loud, sometimes sly, and sometimes uncomfortable. It's often at Langer's expense, though he might not know it. For example, when informed by phone of new and grave charges against Eric, Langer, without missing a beat, proposes "I"ll have my wife come in immediately." The school is also a source of pointed humor, taking its own culture of caring a tad too seriously - "Conferences of Concern" are held in rooms papered in posters proudly professing slogans of kindness despite the bullying that thrives there. And although we (you, I, Dr. Langer, the school, the community at large) can't, of course, condone them, even Eric's cyber crimes, with their juvenile phrasing and wild misspellings, have a comedic side. But the story is ultimately poignant rather than comic: Eric's social isolation and the anguish of a father who doesn't quite understand his son are all too real. Last Word is interesting and engaging, with compelling writing and characters. Langer's story will resonate with anyone who recognizes that in our deeply flawed humanity, parenthood is a very imperfect journey. But where there is love, there is also hope. My thanks to the publisher for a complimentary review copy of Last Word. I often find these sorts of books difficult unless both parties learn something by the end (I know they are supposed to be sort of frustrating but it can be too much) however where humour is involved it makes it a lot easier, so for that I might look this up. Hmmm...kind of intrigued, but I'm tired of these dad stories involving their deep interest in other women. Perhaps it's true, but I've no patience for it!